After at least 900 federal and state police evicted them, on 9th January, from the lands recuperated on 21st December belonging to the ejido San Sebastián Bachajón, Chiapas, the Tseltales have maintained the position of defending their lands; now they have set up a regional headquarters of the ejido between the Agua Azul turning and the boundary with the municipality of Tumbalá. 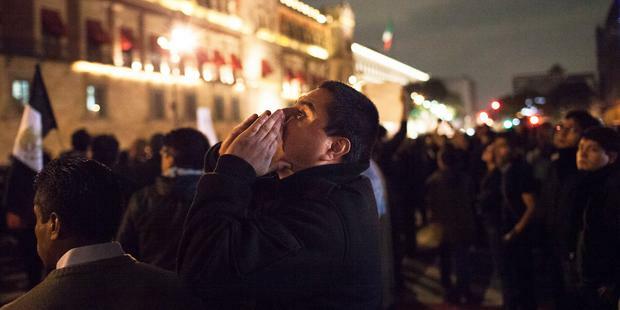 Mexico City, January 30, 2015. After at least 900 federal and state police evicted them on 9th January from the lands recovered on 21st December belonging to the ejido of San Sebastián Bachajón, Chiapas, the Tseltales have maintained the position of defending their land; now they have set up a regional headquarters of the ejido between the Agua Azul turning and the boundary with the municipality of Tumbalá. In the area that connects Ococingo with Palenque and the Agua Azul waterfalls, there is a permanent police presence, so the indigenous demand that the government of Manuel Velasco Coello, Governor of Chiapas, withdraw the members of the police immediately and do not continue with the intimidation and repression. Both the ejidal commissioner Alejandro Moreno Gómez and his vigilance councillor Samuel Díaz Guzmán, from the municipality of Chilón, are organizing shock groups to repress the ejidatarios. “People like Juan Álvaro Moreno and Manuel Jiménez Moreno fire shots at night with high calibre weapons, to foment fear in the population,” report the indigenous in a communiqué. At the same time they make an appeal to human rights organizations and society in general to be alert to any new eviction. The indigenous report that the delegate of the municipality of Chilón, Francisco Demeza Hernández, and local deputy, Carlos Jimenez Trujillo, are possibly planning repression against the people who guard the new regional house and the toll booth. Where those from above destroy, we from below reconstruct! Compañeros and compañeras, we inform you that we continue to do the work of resistance defending our people and territory from dispossession by the bad government; for this reason we are building a regional headquarters in San Sebastián to be a place of work, workshops and sharings (exchanges). The work at this headquarters starts today, we have built it a kilometre from the Agua Azul turning and from the border with the official municipality of Tumbalá. We demand from the bad government that their police leave the lands which have been dispossessed since 2nd February, 2011, because the lands belong to the people and we will not allow them to take them from us for their economic interests. We demand that the ejidal commissioner Alejandro Moreno Gomez and vigilance councillor Samuel Diaz Guzmán stop selling their dignity for money like the former commissioner Francisco Guzmán Jiménez did. We denounce that these representatives of the bad government are organizing the groups of Juan Alvaro Moreno from Xanil and Manuel Jiménez Moreno from Pamalá to fire shots at night with high calibre weapons. And also they are having private meetings with the delegate of Chilón, Francisco Demeza Hernández and Carlos Jiménez Trujillo, local deputy, to plan to displace the compañer@s who are guarding the regional headquarters and those who are collecting the toll at the entrance to the Agua Azul waterfalls; and we hold the three levels of government responsible for any type of attacks or confrontations that may take place. 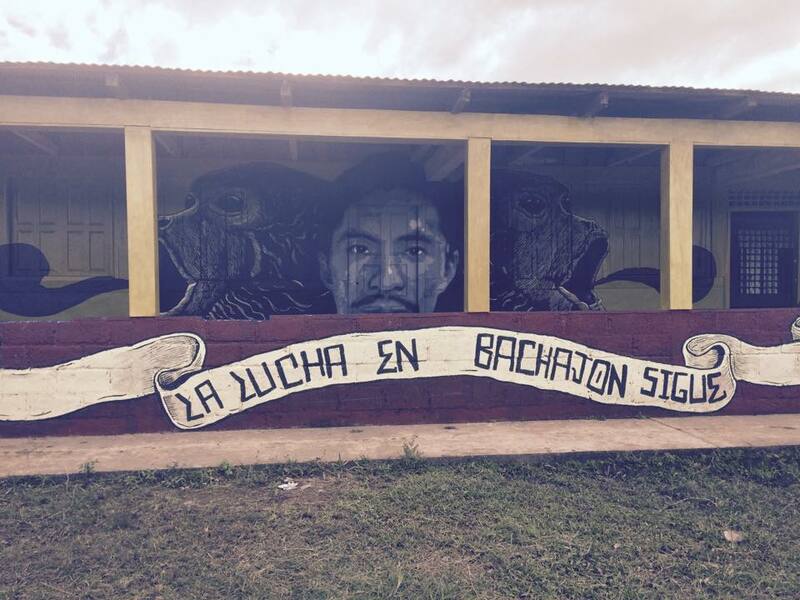 From the northern zone of the state of Chiapas, the women and men of San Sebastián Bachajón send our combative greetings to all the peoples, communities and organisations in resistance, never again a Mexico without us. In a bulletin issued on January 8, the Human Rights Center Fray Bartolomé de las Casas (CDHFBC) reported that the new arrest warrants against those allegedly responsible for the Viejo Velasco Massacre, Ocosingo municipality, “violate the right to fair trial, including the presumption of innocence”. 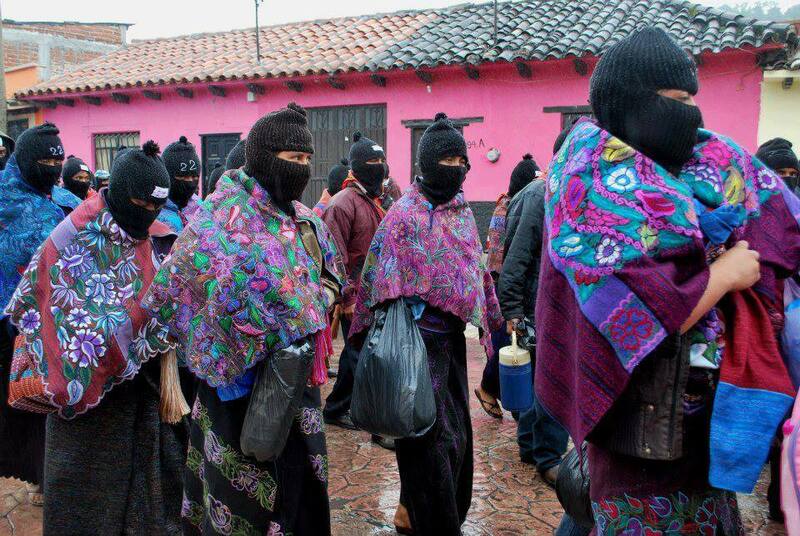 It noted that in September 2014, the suspects, members of the Xi’Nich organization and support bases of the Zapatista Army of National Liberation (EZLN), obtained Court Protection. However, the District Judge of Ocosingo dictated new arrest warrants, although the prosecution has not collected sufficient elements to establish the existence of the alleged crimes nor the responsibility of those indigenous persons. The CDHFBC complained that “the investigation of the Attorney General of the State of Chiapas has been ineffective: they have accused the victims as if they were the perpetrators”, and they have been “criminalized and judicialized “. It warned that from the beginning, the investigation “of this crime against humanity” was distorted. 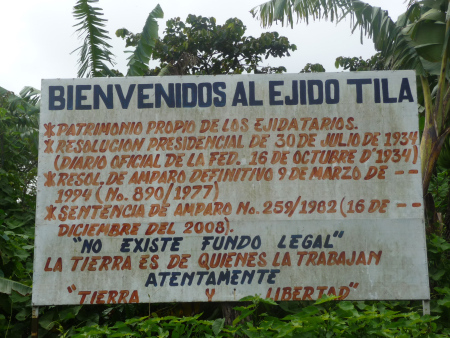 The day of the incident, the alleged perpetrators were in the ejido Nuevo Tila, where actually arrived the displaced persons from Viejo Velasco. The inhabitants provided them support and organized a brigade of observation. 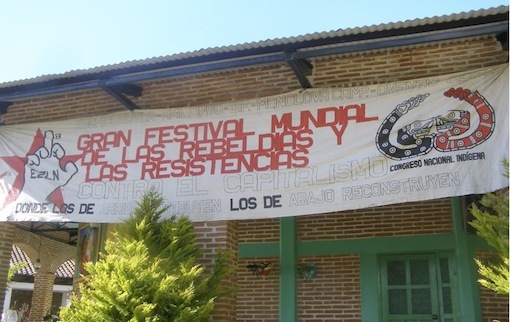 Above: Sign for the first Worldwide Festival of Resistances Against Capitalism. 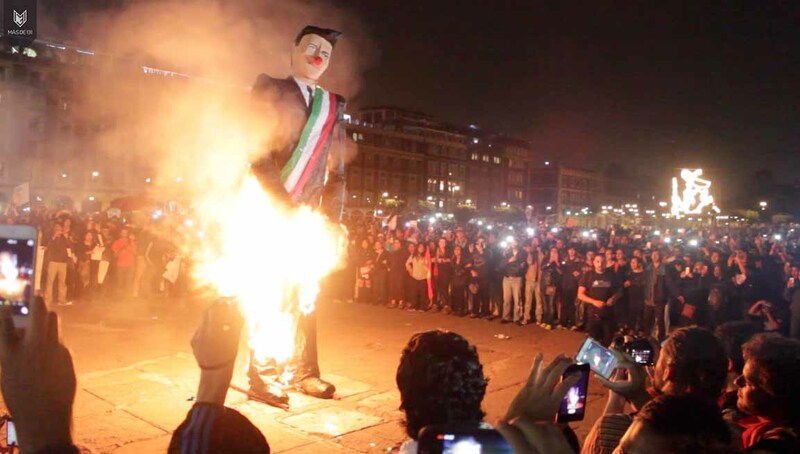 The ghost of Lady Macbeth has appeared before Enrique Peña Nieto. For the past four months the extrajudicial killing and the forced disappearance of 43 rural normal school students from Ayotzinapa are following him wherever he goes. And where he does not go, too. In Davos, Switzerland, in the middle of the closing ceremony of the annual party for the lords of the universe, where it was several degrees below zero outside, a crowd that took to the snowy streets held him responsible for the attack against the young people. Just as it happened to Lady Macbeth with Duncan, in the eyes of many citizens the presidential institution has been stained with blood by the Iguala tragedy. The shadow of suspicion has fallen over his command. Formally favoured by the benefits of sleep, since then Peña Nieto has been acting in a way that corresponds to a lack of sleep. The stench that all the perfumes of Arabia cannot hide surrounds his destiny. The stain does not come clean and the shadow does not disappear. Today, however, he anxiously observes how the Great Birnam Wood, with the parents from the families of the disappeared young people at the front, is walking toward the presidential residence. The tragedy of Macbeth has arrived at Los Pinos [presidential residence]. To try to stop the forest’s march, the federal government wants to close the case in whatever way they can. They are obsessed with closing the case no matter what. On December 4, during his first visit to Guerrero since the tragedy, the president called for “overcoming the pain” left by the Ayotzinapa case and “moving forward.” He has since then, time and again, tried to make people forget the matter. It has, however, all been in vain. The indignation over the tragedy still prevails. The order of forgetting has not been obeyed for one very simple reason: even though four months have gone by, the 43 students have not appeared. The government has been incapable of finding them. Nor has it been able to come up with a plausible and coherent account of what took place on September 26 and 27 in Iguala. Distinguished scientists and human rights defenders have documented a great number of inconsistencies in the official narrative. On January 21, several academics criticized Murillo Karam’s attempt to pronounce the 43 dead, and make conclusions without providing scientific evidence. According to Amnesty International, the investigations made by the Attorney General’s Office (PGR) have been “limited and insufficient.” The supposed delinquents whose declarations make up the official story reported that they had been tortured. 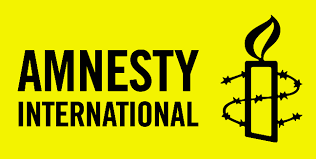 For that reason, Amnesty International insisted that new lines of investigation be opened, including the Army’s probable participation in the violent events. It pointed out that there are many testimonies that say that soldiers were at the place of attack and harassed and detained several students. It warned that the case is also no longer being looked at as a matter of forced disappearance, but as kidnapping and homicide, which blurs the State’s responsibility in the crime. But, instead of responding to indications like those from the parents, scientists and Amnesty International, the authorities have managed to confront the team of lawyers with the parents, isolate the family members and present them to public opinion as ignorant people manipulated by radical political forces. Playing dirty, they revealed the results about the analysis of the remains carried out at the University of Innsbruck without first informing the parents, violating the agreement signed by President Enrique Peña Nieto on October 29. Since the national channels for dialogue have been closed, today the parents are working to internationalize the conflict. Along with the solidarity tours going to the United States, the next stops on this route are kick-starting the interdisciplinary group on technical cooperation from the Inter-American Commission on Human Rights (IACHR) and having a committee of family members visit the Committee on Enforced Disappearances of the United Nations in Geneva. The responsibilities of the IACHR group include the creation of plans to find the disappeared people alive, the technical analysis of the lines of investigation to determine criminal liability, and the technical analysis of the plan for comprehensive attention to the victims, in order to guarantee that the necessary comprehensive attention and reparation will be provided. The ghost of Macbeth has moved to Los Pinos for good. It will stay there as long as there is no justice, truth and reparation for damages for the victims of the Iguala attack. Organized by the Zapatista Army of National Liberation (EZLN) and the National Indigenous Congress (CNI), the first annual Festival Mundial de las Resistencias y Rebeldías contra el Capitalismo, or the Global Festival for Anti-Capitalist Resistance and Rebellion, was held in central and southern Mexico over a two-week period at the end of 2014 and beginning of 2015. The event’s subtitle sums up its purpose well: “While those from above destroy, those from below rebuild.” Taken as a whole, this new Festival recalled the different “intergalactic” meetings hosted by the EZLN in Chiapas in the 1990’s, such as the Intercontinental Encounter for Humanity and Against Neo-Liberalism (1996). According to the statistics made known at the event’s close at CIDECI-Unitierra in San Cristóbal de Las Casas, Chiapas, the number of officially registered participants at the Festival came to over 3400 Mexicans, including 1300 individuals belonging to 20 indigenous ethnicities, and 500 foreigners from 49 countries—though the total number of those who attended the Grand Cultural Festival in Mexico City and the EZLN’s year-end festivities at the Oventik caracol at other points over the course of the Festival must be considered as amounting to several times this total. 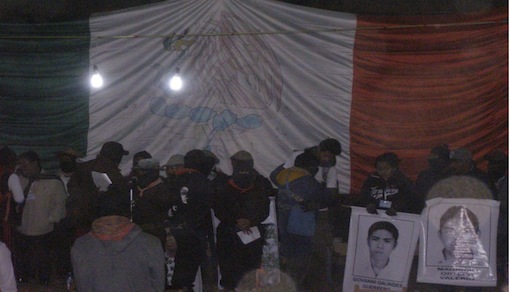 While the Festival generally focused on the numerous problematics faced by Mexico’s various indigenous peoples amidst the power of capital and State—due in no small part, indeed, to the central participation of the CNI in the event—the distressing case of the 43 students from the Raúl Isidro Burgos Rural Normal School who were forcibly disappeared by police in Iguala, Guerrero, in late September also took central stage throughout the event. 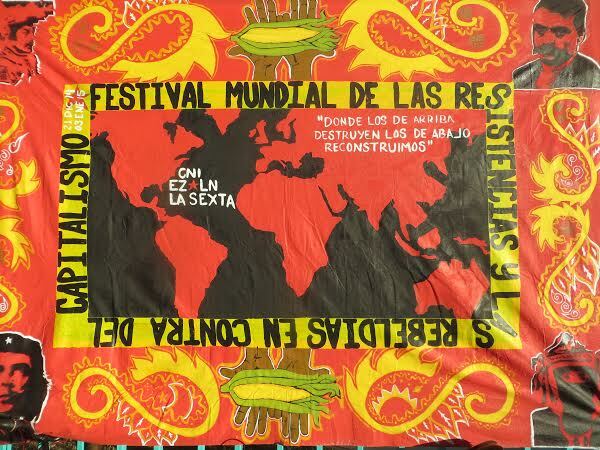 The Anti-Capitalist Festival was inaugurated in Mexico state on 21 December, and the comparticiones (“sharings”) followed for two days afterward in two locations in central Mexico. While I was present for neither, I can here relate the reports made ex post facto at CIDECI regarding the goings-on at these spaces. The launch of thecomparticiones took place simultaneously in San Francisco Xochicuautla in Mexico state and in Amilcingo, Morelos. San Francisco Xochicuautla has become an emblem of socio-ecological resistance in Mexico lately, as the local indigenous Ñatho peoples have opposed themselves to the imposed plan of building a new private highway on their territory—a project that implies vast deforestation, and which has to date seen State repression meted out on those in opposition—while, as two Nahua CNI delegates from Morelos explained to me as we waited together outside the Zapatista Good-Government Council’s office at Oventik on New Year’s Eve, the case of Amilcingo reflects the problems of domestic and foreign rackets, extractivism, and profit in Mexico, as these exigencies result in the plundering of territory (despojo) and fundamentally violate indigenous autonomy. In Amilcingo, in accordance with the vision set forth in the “Integral Morelos Plan” (PIM) that has been on the books for years, there has been an attempt to construct a natural gas pipeline that would supply a planned thermal power station, this despite the various dangers posed to the integrity of such structures within such a seismically and volcanically active area as Morelos. In Amilcingo, as in San Francisco Xochicuautla, indigenous Nahuas have mobilized to prevent the construction project from being carried through. 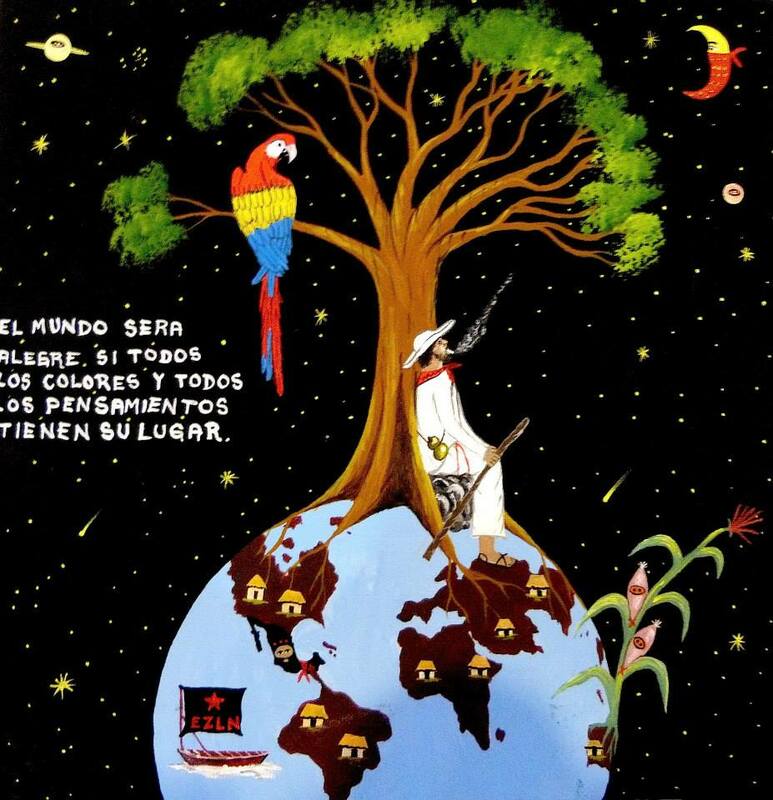 At both sites on 22-23 December, representatives from indigenous ethnicities represented in the CNI and affiliates of the National and International Sixth—that is to say, those who subscribe to the EZLN’s Sixth Declaration of the Lacandon Jungle (2005)—made presentations about their struggles, philosophies, and commitments. Thus was the first part of the Festival completed, with thecomparticiones lasting two days in San Francisco Xochicuautla and Amilcingo each. The next phase of the event—part two of five, we can say—took place in the Iztapalapa district of Mexico City, at the Lienzo Charro, a stable located near the Guelatao metro station, named for the birthplace in Oaxaca of the celebrated indigenous president of Mexico, Benito Juárez, who repelled the revanchist French invasion of 1862 that sought to install Maximilian von Habsburg as emperor and weakened the hegemony of the Catholic Church over Mexican society, in accordance with his Liberal principles—which are very far from the liberal (or neo-liberal) values known in the U.S.! Indeed, the “Grand Cultural Festival,” which started on 24 December and lasted three days, until the 26th, took place a short walk from the “Cabeza de Juárez,” a huge structure commemorating the Liberal Oaxacan president. Principally, the space at the Lienzo Charro was divided between a massive tianguis cultural—a cultural market of sorts, full of food vendors offering huaraches and tacos; anarchists and other radicals selling books, shirts, and prints; and intellectuals representing Praxis en América Latina, which takes after Marxist-humanism and the thought of Raya Dunayevskaya—and two stages for musical and theatrical performances: one named for Compañero Galeano, a Zapatista support-base (BAEZLN) who was killed in a paramilitary attack on the La Realidad caracol in May 2014, and the other for Compañero David Ruiz García, an Otomi indigenous man who died in a traffic accident after having attended the meeting held between the Zapatistas and the CNI that very same month to mourn Galeano. The Grand Cultural Festival also provided various activities for children, hosted chess and soccer tournaments, and opened space for various workshops addressing such questions as urban gardening, traditional Mexican medicine, eco-villages, prisoners’ rights, digital self-defense, and solidarity economics. When I arrived to the Festival on the morning of the 24th, the activity on hand on the “Compañero Galeano” stage was a series of speeches made by padres de familia and even by students who had survived the police attack in Iguala of 26 September. 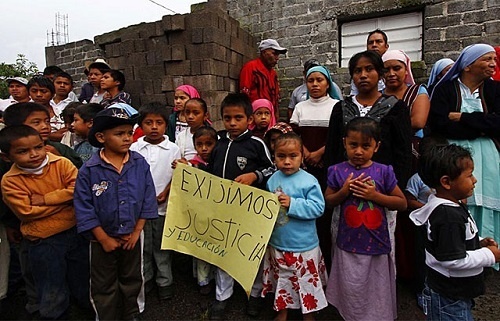 At least one father and mother expressed the hope that their sons were in fact still alive, in this way rejecting the official account of the events of 26-27 September which waspresented by Attorney General Jesús Murillo Karam in early November: that is, that the 43 students had been expeditiously handed over by the Iguala municipal police to the “United Warriors” drug cartel, who subsequently murdered them and incinerated their remains. Omar García, a student-survivor who has become a spokesperson of sorts for the padres de familia, announced that, though the 43 students had been unarmed at the time of the police attack against them and the forcible disappearance which followed, many of the parents now wished that their sons had actually been carrying weapons that night with which to defend themselves. That morning of the 24th, which was marked by strong rains, the padres de familia were organizing their action for that night, Christmas Eve—known as Noche Buena (“The Good Night”) in Spanish—which was to involve a public protest outside the Los Pinos presidential residence. The action, which proceeded despite the rainstorm which raged that night, was meant to demonstrate to the government and Mexican society as a whole that, for the parents of the disappeared, there could be no Noche Buena. 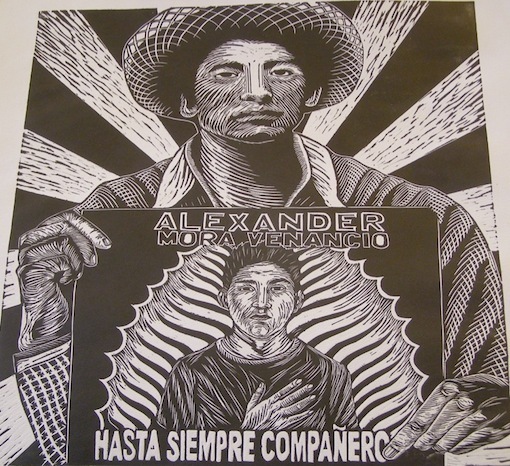 At the tianguis that day, I came across a print commemorating the life of Alexander Mora Venancio, 21 years old, the only one of the 43 whose remains have been positively identified by Argentinian forensics experts to date. After this sobering beginning, the Grand Festival Cultural proceeded principally to open space for a multitude of rebellious and revolutionary theater-artists, dancers, and musicians to share their art and vision with the masses of people who came to attend the event, even in spite of the heavy rains on the 24th. That morning, a Nahua man and his comrade provided a thorough public explanation of how the imagery of theVirgen de Guadalupe—originally depicted by a Nahua artist, in fact—preserves and expresses a myriad indigenous symbols, from the stars and flowers which adorn the Virgin’s dress to the waxing moon on which she stands. The duo showed that the iconography of the Virgencommunicates the Nahua notion of Tonantzin, or “our beloved mother,” “la madre más primera” (“the first or most important mother”), and as such stands in for la Madre Tierra, Mother Earth. Notable musical artists from that first day of the Cultural Festival included the collaboration between Raíces Libertarias (“Libertarian Roots”) andMentes Ácratas (“Anarchist Minds”), who melded stirring hip-hop beats with a profound anti-authoritarianism to simultaneously entertain and enrage; Inercia (“Inertia”), a group of young punk rockers who dedicated at least one song to the inertial manner with which humanity would seem to be careening toward eco-apocalypse; and a Chilean rapper who concluded one of his songs using the following lines, palpably referring to the contemporary eco-political situation identified by “Inercia”: “La tierra un infierno / Y la humanidad en cenizas” (“The Earth, an inferno / And humanity in ashes”). The Grand Cultural Festival continued with musical celebrations on the 25th and 26th as well. The former day, reggae artist El Aaron sang the praises of cannabis while condemning the police (“Policias en helicopteros / Buscando marijuana”), in this way presenting an embodied rebellion against Zapatista rebelliousness: for it is known that all drugs are forbidden in EZLN communities. The all-women’s groupBatallones Femininos (“Female Batallions”) provided raps having to do with feminist issues on the evening of the 25th—much as they would do live on Radio Insurgente during the night of the first day of the Festival’s closure at CIDECI just over a week later. Also the same evening from the “Galeano” stage, Sonora Skandalera provided everyone who so desired and could the opportunity to dance to the tune of their joyous music. In contrast to the first two days, which were open to all, entrance to the third and final day of the Cultural Festival was limited to those who paid 70 pesos to attend a concert that doubled as a fundraiser for the CNI. A number of celebrated Mexican and Latin American groups performed this day, including El Sazón María, Mr. Blaky, Polka Madre, Antidoping, El Poder del Barrio, and others. Among the most impressive artists who performed on this final day was the Mexikan Sound System. Like El Aaron, Mexikan Sound System played a song explicitly dedicated to the legalization of marijuana, and much of the rest of the duo’s oeuvre would seem to be similarly politically radical, discussing State terror, migration, and the drug war. Another one of their songs, “No Te Olvido” (“I Will Not Forget You”), which is dedicated to “all those who have given their lives in the attempt to form a world in which many worlds fit,” features the following gripping refrain:“Pasarán los dias / Pasarán los meses / Pasarán mil anos / Pero no te olvido” (“Though days, months, and even a thousand years may pass, / I will not forget you”). Impressively for an artist who identifies consciously with the reggae musical tradition, Gabo Revuelta, the Mexikan Sound System’s MC, explicitly affirmed sexual diversity in personal comments between songs, both during this performance at Lienzo Charro, as at a subsequent one he did in collaboration with Panchito Rha, Sista Gaby, and Manik B (Al Sentido Kontrario) at El Paliacate Centro Cultural in San Cristóbal de Las Casas. 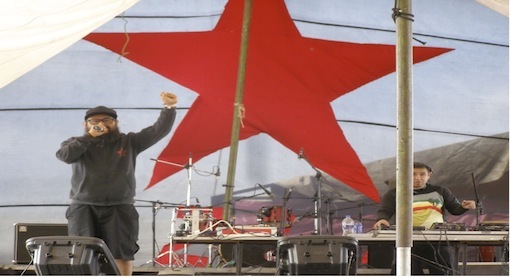 In contrast,Lengualerta, another celebrated Mexican reggae artist who performed at the Grand Festival on the 26th—and in fact dedicated a song to Compañero Galeano, having modified the lyrics of the famous “Hasta Siempre Comandante” song to accommodate the murdered Zapatista—saw a brawl break out at the end of his concert with Al Sentido Kontrario in San Cristóbal a week later, owing to controversy surrounding the place of LGBTQ individuals in his vision for resistance against Babylon. The third part of the Anti-Capitalist Festival consisted of anothercompartición, this time held in Monclova, Campeche state, on the Yucatan Peninsula, from 28 to 29 December. There, as at other points during the Festival, 43 empty chairs were set up to commemorate the disappeared students from Ayotzinapa; the Yucatan being a tropical region, moreover, the comparticiones were interrupted on various occasions because of torrential rainfall. Those in attendance at Monclovawere told of land-grabs in neighboring Quintana Roo state, where 26,000 hectares have been bought up in recent years by Mennonite families and German, Filipino, and Japanese corporations, leading to a mass-exodus of campesin@s from their formerly communal territories,in a continuation of processes which acutely worsened with the coming into law of the North American Free Trade Agreement (NAFTA) in 1994. Monclova itself is the site of a civil-resistance movement whose members refuse to pay for electrical energy provided by the Federal Electricity Commission (CFE), holding out the alternative of a popularly managed energy system that makes electricity available at affordable prices. 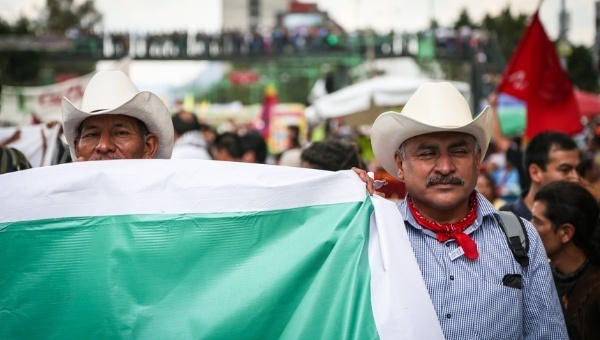 In this sense, the movement in Monclova, which is comprised of 20 participating communities, echoes the resistance taken up by groupings like PUDEE (Peoples United in Defense of Electricity) in Chiapas, as elsewhere in the country. Beyond this, those participating at the compartición in Monclova heard from representatives from the “La 72” migrant-home in Tenosique, Tabasco, about the “exterminationist policies” overseen by the three levels of the Mexican government as regards the transit of Central American migrant workers through the country toward the USA—such that the Mexican side of the border is reportedly full of mass-graves containing the bodies of such economic (and environmental) refugees. In fact, the Central American mothers who have long organized periodic missions to seek out their children who have gone missing after passing through Mexico en route to el Norte estimate that a full 70,000 migrants have gone missing in the country in the past three decades. Much like the previous year, live music was performed from the Oventik stage before and after the “political act” which saw Sup Moisés and thepadres de familia make their public addresses. This music included various cumbias that brought the BAEZLN and their sympathizers alike to fill the basketball court adjoining the central stage and dance to welcome the change in year. 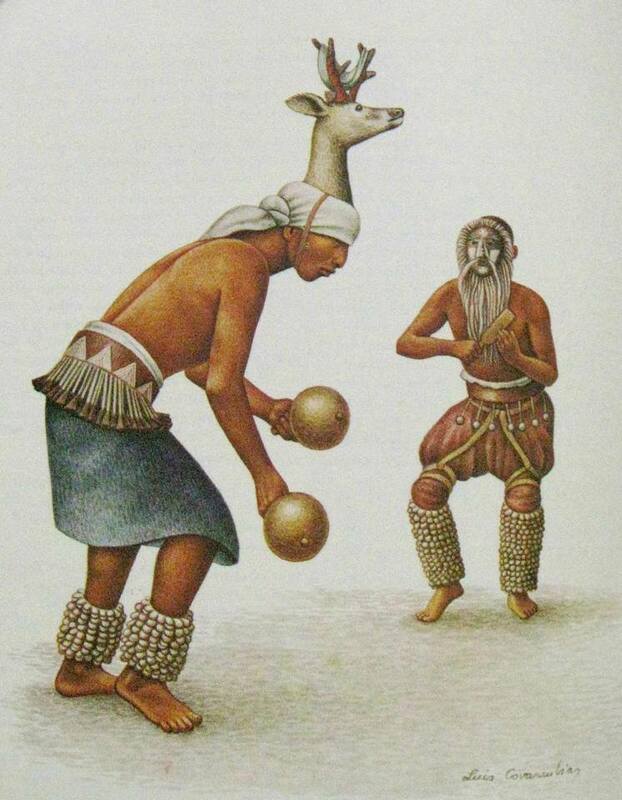 In fact, both the cumbias and dancing continued on through the night until shortly after dawn. In contrast to the case at year’s end 2013, the weather cooperated through most of the night this time, with the rains coming only around 3 or 4am. The next morning, for this reason, Oventik was a veritable mudscape. But that, taken together with the heavy fog which accompanied the mud (lodo, in Spanish, or che, in Tsotsil), did not stop the BAEZLN from continuing with their planned volleyball and basketball tournaments on the morning of 1 January. Though essentially all the proposals made by participants at the closure of the Festival shared a generally radical political analysis, the specific details varied in each case, and though I cannot review all the recommendations that were made, I will mention some of the most illuminating ones. One of the first speakers noted that capitalism is destroying the world, and it was for this reason that she had responded to the calls by the CNI and EZLN to attend the Festival: she posed the fundamental question, “How it is that we will destroy capitalism?” Another participant suggested that we work to report on the situation in Mexico and wherever else the plundering of land and resources is a pressing issue; arguing that we must struggle in the interests of future generations, she designated the State as enemy. A number of attendees separately called for a return to the traditional cultural and political forms of indigenous societies as a means of rejecting capital. Furthermore, a representative from a Mexican collective focusing on disability issues shared his view that disability per se is not a problem, as it is considered in the medical model, but rather that the hardships faced by people with disabilities have to do with social exclusion. Affirming the proposal that has been advanced by some of the padres de familia of the disappeared students, one individual person called on all Mexicans to boycott electoral politics, while another called for a new constituent power to intervene and form a new constitution, toward the end of instituting a “transitional government” in 2018—the very year, incidentally, in which the current Chiapas governor, Manuel Velasco Coello (el Güero), hopes to run and be elected president as the PRI candidate. A male in the crowd advocated that we all decolonize our minds specifically by identifying patriarchy as a principal enemy of the Sixth National and International, and engage in direct action against violence against women, which in Mexico is taking on epidemic proportions. Advocating the transcendence of national borders, a representative from CACITA Oaxaca announced a Caravana Mesoamericana para el Buen Vivir (a “Mesoamerican Caravan for Living Well”) that will launch its journey in April of this year—in many ways echoing the mission of the Caravana Climática por América Latina (“the Climate Caravan through Latin America”), which began itsaction-tour through Mesoamerica and Central and South America in northern Mexico a year ago, only to face repression at the hands of the “revolutionary socialist” government of Rafael Correa days before it had planned to arrive at the Twentieth Conference of Parties (COP20) to the United Nations Framework Convention on Climate Change (UNFCCC), with this destination having been the original end-goal sought by thecaravaner@s.
 José Gil Olmos e Isaín Mandujano, “Al estilo Peña Nieto, pero con madre vicegobernadora.” Proceso no. 1992 (4 January 2015), 16-19. We already know what to do. Now we need an agreement about how to do it and with whom. 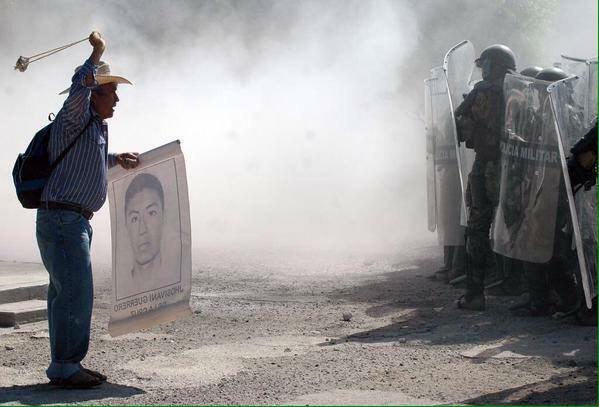 The political classes lost the little credibility they had because of Ayotzinapa. A consensus formed through long experience crystalized like this: only violence, corruption, impunity and incompetence come from above. Another consensus emerged along with this: the institutions themselves are rotten, not only those that direct them. They are not at the service of the people, nor do they fulfil their functions. We need substitutes for them. It also extends to a consensus that comes from perspective. In recent decades the political classes adulterated and finally dismantled what remained of the 1917 Constitution. We need another one. Or rather: a constituent mechanism that formulates the new social order from below. To do that we must conceive how we get rid of what is and create democratic mechanisms of transition that forestall and contain the current disorder and violence. There is no consensus about the way to do all that. Among those that share the conviction that we must remove the current functionaries and construct other institutions, some think that the only way of attaining it without violence is to stay within the current frameworks, through the electoral and party path. According to them, we would have to use ballot boxes to disqualify them. Any other way would be illusory or undemocratic and violent. Thus emerges a profound difference, because many other people consider that what is illusory and undemocratic is to continue using ballot boxes, entirely inadequate for what is sought. What’s missing is to break with the current frameworks. This vision of our history, which ignores the millions of ordinary men and women who gave their lives in the changes that occurred in the country, or that converts them into obedient masses, manipulated or controlled, forms a tradition in effect that has been updated in the era of globalization and the mass communications media. A leader or at least a party or a group continues to be sought. They have to constitute the minority directorate, a disciplined and articulate leadership body. Without them we would fall into disorder and violence and the changes we seek would be frustrated. A vigorous current attempt to break with that tradition proposes reconstruction from below, by ordinary men and women, without leaders, luminaries, experts, vanguards or parties. It is certain that a handful of men have assumed the representation of all Mexicans ever since the country was born. Morelos asserted that it was the nation’s sentiment to be governed by the creole minority. That sentiment prevailed among those who forged the new social order, expressed in the Constitution of 1824, marginalizing Indian peoples, who then represented two-thirds of the population and had been the principal champions of the revolution for Independence. In a similar manner, successive elites converted their own ideals and interests into the mould in which the national will should be formed. The ritual of elections, which was maintained even in times of the dictatorship to legitimize the social pact imposed from above, never managed to compensate for that absence of the majority. The general will cannot be reduced to a statistical grouping of individual votes to elect individuals or to define postures. “My dreams don’t fit into your ballot boxes,” the Indignados of Spain said well. It is not a document that will reconstitute us as a nation or permit us to reconstruct the coexistence and social fabric, or one that was formulated with a social sense and patriotic ardour by the country’s better minds. As LaSalle said, constitutional questions are not issues of law but rather of power. We’re dealing with defining those who have it and how it is articulated and how it constructs the general will: above or below, with elections that delegate everything to a few… or without them, with autonomous governance. Faced with the immense national tragedy, no assembly of notables can assume the transition or even less determine the new direction and the ways in which we reconstruct. The challenge consists in attaining that the very diverse social subjects who from below have been resisting dispossession and oppression are finally those who conduct the transformation. Far from representing the chaos and disorder, trusting in the wisdom and experience that they have been accumulating from below is the only alternative to the chaotic disorder that characterizes the national moment and will continue as long as we continue to render social engineering from above. In that transit, we also need certain people, perhaps a handful, who are moral guarantors of the transition, bind together a consensus and intellectually nourish change. The government would not be in their hands, but in the hands of the people who would watch, control and reconstruct the institutions. That way, democracy would be where it ought to be: where the people are. And they would be those who maintain the social order and would be a barrier to the current chaos and violence. Judge Guillermo Campos Osorio, head of the Federal District Court 12 in Civil Matters based in the Federal District ordered Mexico’s Executive Branch to suspend any new permits, effective September 17, 2013, for growing genetically modified maize in open fields in Mexico while the collective demand for action for the human right to the biodiversity of native corn, brought by 53 citizens and 20 rural and urban organizations (Miguel Concha, La Jornada, 3/22/14) is being settled. This court order was issued before the ruling by Judge Jaime Manuel Marroquín Zaleta, head of the Second Unitary Court in Civil and Administrative Matters of the First Circuit, who ordered that the demand might continue its legal course. Subsequently, Marroquín reiterated that the suspension of planting genetically modified organisms must remain in place due to the risks of irreversible damage to biodiversity. For the last 14 months, the Executive Branch has had to obey the suspension. The nature of the collective demand for action is “diffuse”, since it defends the right of all Mexicans, present and future. Moreover, its objective is “declarative”, because it does not seek reparation for damages, but rather a permanent ban on the open field planting of transgenic corn in the national territory. Why do the plaintiffs argue that the biodiversity of native corn is a human right of Mexicans? 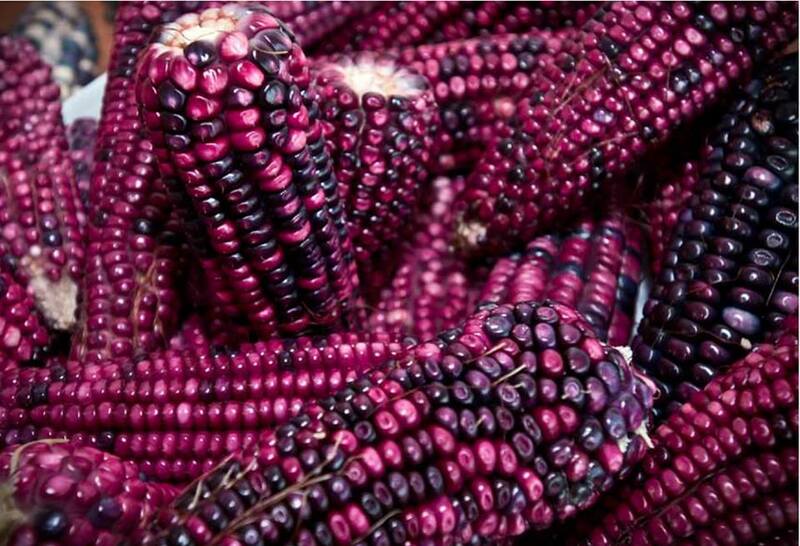 For at least five reasons: First, because without native corns no one could produce the 600 dishes of our multicultural cuisine based on native corn, with its organoleptic characteristics (sense-based, i.e., texture, taste, smell and colour) that we Mexicans demand. There are more than 300 kinds of tamales, tlayudas, totopos oaxaqueños, totopoxtles from the Gulf, tlacoyos, Pepitilla tortilla corn, Chalqueño corn, pozole, elotes de cacahuacintle, etc., and drinks—pozol, tascalate, tejate, tejuino—, atoles such as tart Ixtenco, and so on. What can certainly be prepared with non-native corns, including imported ones, is the low quality industrial tortilla that we urban Mexicans currently suffer. The second reason: 53 percent of the calorific intake of the national diet and 39 percent of the protein comes from the direct consumption of corn. We know how to prepare corn as food and how to manage it to avoid contamination with mycotoxins, which are carcinogenic. What we would not know is how to continue feeding ourselves in a healthy way if our corn were genetically contaminated by GMOs since, as recent studies suggest, its consumption by mammals in experiments is associated with damage to the health of a “chronic subclinical” type. The third reason: More than half of the 8 million hectares planted each year with corn in Mexico are low quality, even marginal, agricultural land being taken advantage of by millions of campesino families. These lands and the native corn provide both their source of employment and food. National and international ‘improved’, modern varieties, including transgenic corns that they aim to sell us, do not thrive in these conditions. 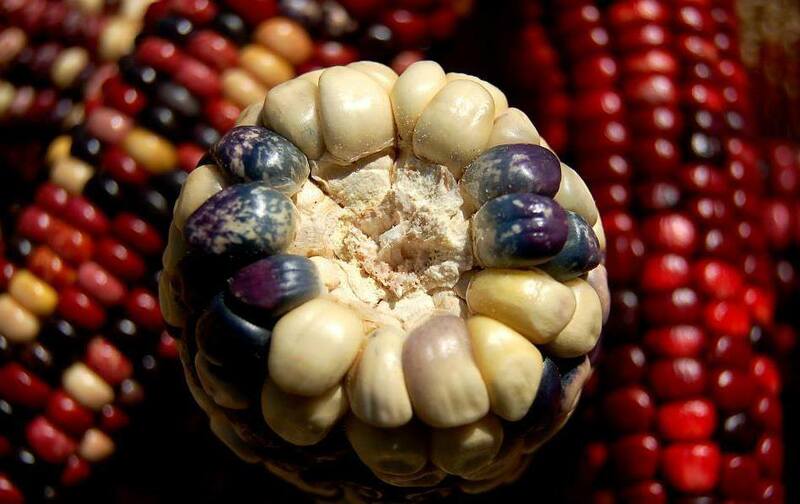 The fourth reason: native corns and their teosintle ancestor, both widely distributed throughout the country, are the only tangible source of genetic adaptation to the challenges that climate change will bring to food security. The transgenic technology that they sell us is obsolete, unpredictable, carries risks and, like the genie in the bottle, it is impossible to return it once it has been let out. The collective demand for action and a handful of incorruptible judges who bring honour to the Judiciary are all that prevent the transnational corporate interests, the Mexican government and collaborationist Mexican scientists from removing the cap from the bottle. The fifth reason: the nation would irreversibly lose the technological sovereignty over its main staple, while the current government, through incompetence or neglect, would contribute to the disappearance of any social, private or public offering of communal corn seed. There is a small group of lawyers (Collective AC)—powerful in principles, in intellectual resources, and incorruptible—which is steering the rudder and engine of the litigation strategy for the collective demand lawsuit. Titans of legal technique, such as Attorney Bernardo Bátiz**, and of human rights, including Father Miguel Concha***, are also collaborating. The Union of Scientists Committed to Society AC has provided the required scientific support. But it is a confrontation between David and several Goliaths. What is much needed now is committed reinforcement by Mexican civil society in order to defend this strategic resource of the nation! *Antonio Turrent Fernández, Agronomist, is current president of Mexico’s Union of Scientists Committed to Society. 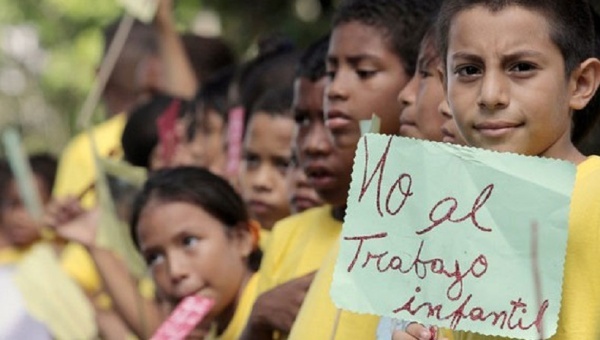 Mexico has one of the largest child labor forces in Latin America, second only to Colombia. At least 21 percent of all Mexican youth between the ages of 7 and 14 – what amounts to 651,000 kids – give up school because they are forced to work, according to a new study released by UNESCO. The figures mean that Mexico has one of the largest child labor forces in all of Latin America, second only to Colombia where 25 percent of youth are forced to work. Worldwide, the number is also higher than other countries such as Indonesia (19 percent) and Sri Lanka (10 percent) and comparable to Cambodia (23 percent), Zambia (20 percent) and Nigeria (25 percent). The UNESCO report also highlights the disparities between rich and poor in the country, where children from poor families in rural areas tend to have little chance of entering school at any point in their life, while wealthy urban families have more access to education. According to state numbers, 3.1 million kids across the country do not attend school, but only 651,000 children substitute classroom learning specifically for work, usually because families are in need of extra income. Other causes include entrenched gender roles, where impoverished families are often forced to choose between their son or daughter to send to school (which is generally the male), and regional conflicts or violence in the country that prohibits children from attending school. According to UNESCO, countries have a duty to ensure education for all, and should do more to make sure that the need to work does not compete with the aspiration to educate themselves. A new study shows that over 60 percent of Mexican youth trying to enter the United Stares are fleeing situations of violence. 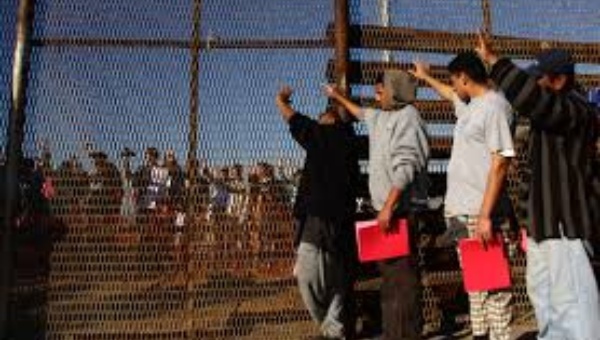 Each year, the United States Border Patrol stops 17,000 young Mexicans trying to enter the United States illegally, according to a new study released Friday by the Washington Office of Latin America (WOLA). The report also states that these youth, most of whom are fleeing situations of violence, including being exploited by gangs, are “rarely listened to” or asked about the risks they faced at home. They are deported almost immediately. “There are many problems with the evaluation of children: Often interviews are conducted in a public environment that intimidates children, agents do not have adequate training to deal with vulnerable children and often do not know how to ask about abuse and trafficking,” the WOLA study stated. According to the report, “Mexican Immigrant Children Forgotten at the Border,” Mexican children do not see the same kind of protections afforded to minors from Central America when they are detained at the U.S. border. The United Nations warned Obama that people coming from these countries should be treated as refugees as they are likely fleeing situations of violence, prompting the U.S. to implement certain protections for them. However, these migrant children still face eventual deportation. A similar report was released by the U.N.’s refugee agency, which says 59 percent of all the unaccompanied Mexican minors detained at the border are fleeing situations of violence. The group also states that less than 5 percent of Mexican children detained at the border actually get the opportunity to present their case in front of a migration judge to determine whether they are eligible for protection in the U.S. The WOLA report concludes by asking for greater investment and resources into violence prevention programs in Mexico and for better training for border security services on how to deal with and assess child migrants. Erika Guevara Rosas, Amnesty International’s Americas Director. (IPS) – The Mexican government will face close scrutiny from the United Nations Committee on Enforced Disappearances – a phenomenon that made international headlines after 43 students from a rural teachers college were killed in September in Iguala, in a case that has not yet been fully clarified. 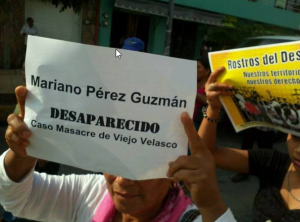 Twenty-six human rights organisations have sent the U.N. Committee 12 submissions on the problem of forced disappearance, one of the worst human rights issues facing this Latin American country, where at least 23,000 people are registered as missing, according to official figures that do not specify whether they are victims of forced disappearance. On Jan. 8, in an addendum to their submission to the U.N. Committee, four organisations stressed the “lack of capacity” and “tardy reaction” by the authorities in this case. The court decision validates Sonora state and the national government to pump water from the Yaqui River. Mexico’s Supreme Court ruled that the water concession titles that were granted by the federal and Sonora state governments to pump up to 75 million cubic meters of water via the controversial Independent Aqueduct from the state’s coveted Yaqui River for human consumption to the city of Hermosillo were doneso legally. The decision shoots down two constitutional cases brought by the municipalities of San Ignacio Rio Muerto and Cajeme, which oppose the water pipeline project because of its potential negative effects to their water irrigation systems. However, the Supreme Court did order that a new environmental impact study of the project be conducted, given that the two municipalities were not given audience to the original study. Since 2010, the Independence Aqueduct project has sparked opposition and protests primarily by the Yaqui indigenous tribe. In 2014, Yaqui tribe spokesmen Mario Luna and Fernando Jimenez were arrested in what human rights defenders call the Sonora government’s attempt to silence Yaqui protest. The aqueduct openly violates a 1940 presidential decree by then President Lazaro Cardenas, which guarentees that at least 50 percent of the water from the Yaqui River pertains to the Yaqui Tribe. The project was initiated violating the indigenous people’s right to free, prior and informed consent. In 2011, the Environment Secretary (SEMARNAT) approved the Environmental Impact Statement and granted permission to begin the project, which also included the use of 50 million cubic meters of water for construction. Of the 55 Yaqui communities, only 30 percent currently have access to drinking water. It is also not just the 40,000 Yaqui people who live in the region and depend heavily on the water supply from river, but also up to 1 million people from the nearby city of Obregon, who are mostly small-scale agricultural and livestock producers. The 172 km long mega-project transports more than 75 million cubic meters of water per year from the Novillo dam, which is fed by the Yaqui river, to supply the growing urban complexes of Hermosillo and to supply the large agroindustry in the region. It was proposed and initiated by the current Sonora governor, Guillermo Padres, of the center-right National Action Party (PAN). The decision by the Supreme Court of Justice of the Nation (SCJN) to allow operation of the Independence Aqueduct sets a bad precedent for the rule of law, said Andrea Cerami, human rights coordinator at the Mexican Centre for Environmental Law (CEMDA). The message it sends to society is that it doesn’t matter if an individual [company] begins a project without consulting the owners of land and other natural resources, or if [the project] lacks an Environmental Impact Statement (EIS), she said. On one side, [Cerami explained,] the Court itself cancelled the authorization of the Environmental Impact Statement and asks to replace the process, but it allows operation of the aqueduct. In addition, she noted, this leaves legal uncertainty for everyone. By neither providing specific information about the quantity of water extracted from the river for transfer to Hermosillo [Sonora state capital] nor what remains for consumption in the Yaqui Valley, it is impossible to know whether the work is sustainable, which can harm the citizens of both regions. On May 8, 2013, the Court decided the amparo [protection, like an injunction] in review and ordered SEMARNAT [Secretariat of the Environment and Natural Resources] to hold a consultation with the Yaqui tribe, in accordance with international standards for indigenous peoples’ right to consultation, but that process stopped last July. Geopolitics helps us understand the world in which we live, especially in turbulent times like these, characterized by global instability with its string of changes and permanent oscillations. But when geopolitics addresses the activity of anti-systemic movements, it has its limits. It gives us a reading of the stage on which they act, which is no small thing, but it cannot be the central inspiration of the liberation struggles. In my view, Immanuel Wallerstein** is the one who has managed to excel in describing precisely the relationship between chaos in the world-system and the revolutionary transformation of movements. In his latest article, titled “It is Painful to Live Amidst Chaos,” he points out that the world-system is self-destructing, with the coexistence of 10-12 powers capable of acting independently. We are in the middle of a transition from a unipolar to a multipolar world, a process necessarily chaotic. During periods of instability and crisis, activity by the [social] movements can more effectively influence the world’s redesign. In time, it is a necessarily brief window of opportunity. It is during these storms, rather than in periods of calm, when human activity can alter the course of events. Hence the importance of the current period. Some of Wallerstein’s works published in the collection El Mundo del Siglo XXI [World of the XXI Century], directed by Pablo González Casanova, address the relationship between systemic chaos and transitions to a new world-system (After Liberalism and Unthinking Social Science, Siglo XXI, 1996 and 1998). In Marx and Underdevelopment, published in English three decades ago, in 1985, Wallerstein warns of the need to rethink our metaphor of transition, since from the nineteenth century we have been embroiled in the debate between evolutionary versus revolutionary pathways for coming to power. I believe that the most controversial point, but also the most convincing, is Wallerstein’s assertion that we have believed that a transition is “a phenomenon that can be controlled” (Unthinking Social Science, p. 186). If the transition can only occur as a result of a bifurcation in a system in chaos, as the complexity scientists say, then expecting to direct it is both illusion and carries the risk of re-legitimizing the order that is breaking down if it uses state power. He adds that revolutions can do their best work by promoting the collapse of the system. This would be an initial way of influencing the transition: by sharpening the collapse, promoting chaos. As the author himself acknowledges, a period of chaos is painful, but it can also be fruitful. Moreover, the transition to a new order is always painful, because we are part of what collapses. Thinking in terms of linear, tranquil transitions is a tribute to the ideology of progress. After 1994 we began to become familiar with a second way of influencing the transition, which allowed us to enrich earlier conclusions. This is about the creation, here and now, of a new world; not as a foreshadowing, but as a concrete reality. I refer to the Zapatista experience. I think that both modes of influence (collapse and creation) are complementary. 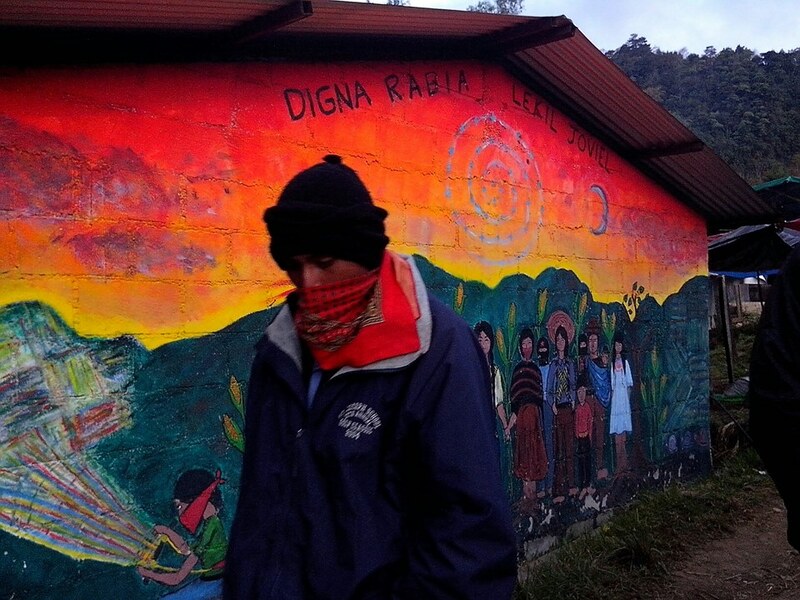 The Zapatistas have created a new world in the territories where they are settled. It is not “the” world that we imagine in our old metaphor of transition: a nation-State where a totality is constructed symmetrically to the capitalistic [system] that claims to be its negation. But—if I understood something that its supporters taught us during the escuelita [little school]—this world has all the ingredients of the new world: from schools and clinics to autonomous forms of government and of production. When systemic chaos deepens, this new world created by the Zapatistas will be a ‘must‘ for those from below. Many do not believe that the systemic chaos can deepen. However, we are facing an outlook of interstate and intrastate wars joined with the “fourth world war” now underway of capital against the peoples. These are some of the chaotic situations that we envision. During the same period, they may coincide with developing climate chaos and “health chaos”, according to the World Health Organization’s forecast of the forthcoming, inevitable expiration of antibiotics. In history, the great revolutions occurred amid horrific wars and conflicts, as a reaction from below when everything was collapsing. During the Cold War, the hypothesis spread that the contestants would not use nuclear weapons that assured mutual destruction. Today, there are few who would make that bet. Before us a new metaphor is being born for the possible transition: when the world-system begins to disintegrate generating tsunamis of chaos, the people must defend and rebuild life. By so doing, it is likely that they might adopt the type of constructions created by the Zapatistas. This happened in the long transition from antiquity to feudalism and from feudalism to capitalism. Amid the chaos, people tend to bet on principles of order, as some of today’s indigenous communities are doing. Some of this is already happening. Some PRI families turn to the clinics in the caracoles. Others seek in the committees of good government a fair solution to their conflicts. Never have the peoples moved en masse to the systemic alternatives. One day one family does it, then another, and so on. We are moving into a new world, in the midst of pain and destruction. *Raúl Zibechi, researcher-activist and journalist, was born (1952) in Montevideo, Uruguay. Active in the youth and resistance movement until 1975, he sought exile in Buenos Aires, Argentina; then subsequently spent ten years in Madrid, Spain, associated with the Communist movement doing literacy work with peasants. Working since 1968 as a journalist and researcher-militant, he has toured almost every country in Latin America, with special emphasis on the Andean region. Familiar with many of the movements in the region, Zibechi helps to provide training and outreach for Argentine, Paraguayan, Bolivian, Peruvian and Colombian peasant farmers and indigenous Mapuche communities. Zibechi’s theoretical work is aimed at understanding and defending the organizational processes of these movements. *Immanuel Wallerstein, American sociologist, historical social scientist, and world-systems analyst, arguably best known for his development of the general approach in sociology which led to the emergence of his World-System Theory. In 1976, Wallerstein became head of the Fernand Braudel Centre for the Study of Economies, Historical Systems and Civilization at Binghamton University, New York. The Centre’s mission is “to engage in the analysis of large-scale social change over long periods of historical time.” Wallerstein served as a distinguished professor of sociology at Binghamton until his retirement in 1999.